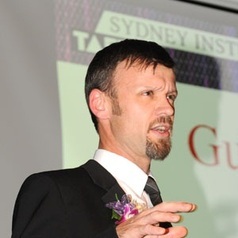 Fraser Torpy began at UTS in 1991 as an undergraduate, and has gone on to pursue Honours and a PhD there. He is now part of their academic team at UTS. Dr Torpy’s research has focussed on several areas of microbial ecology, notably on the biodegradation of volatile organic pollutants by soil bacteria and the aetiology of respiratory fungal disease. Since 1995 Dr Torpy has taught in a diverse array of fields which include experimental design and data analysis, computing, ecology, botany, general, clinical and environmental microbiology (bacteriology, mycology, epidemiology), biochemistry, instrumental analysis, environmental engineering, evolution and first year biology, and recently, urban sustainability.